When Speaker of the House John Boehner announced at the end of September that he would resign from Congress, he immediately started a race to be the Chamber’s next presiding officer. The House needs a Speaker to conduct business, so the Members will elect one before October 30, when Boehner announced his resignation would go into effect. It is exceedingly rare for Congress to elect a Speaker in the middle of a Congress. The last time this happened was when Tom Foley replaced Jim Wright of Texas who was forced to step down following a damaging report from the House Ethics Committee, in June 1989. 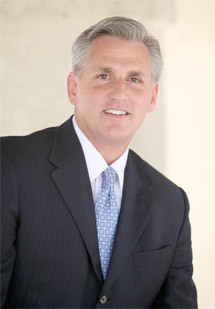 Majority Leader Kevin McCarthy of California is expected to be the Republican nominee for Speaker later this month. The office of Speaker of the House of Representatives was written into the U.S. Constitution, which says that the Members “shall chuse their Speaker and other Officers” (Art I, Sect 2). Election of a Speaker is a two-part process. First, each party must nominate their candidates for Speaker. The Republicans will nominate their candidate on Thursday, October 8. Current Majority Leader Kevin McCarthy is the front-runner, although House Oversight Committee Chairman Jason Chaffetz of Utah and Representative Daniel Webster of Florida have announced they will seek the nomination. Assuming the Democrats even go through the formality of choosing a candidate, they will presumably nominate their leader, Nancy Pelosi of California. Next, the full Congress must meet to choose between the two nominees. Generally speaking, the Members of each party vote for their party’s nominee, so the majority party candidate is successfully elected Speaker. Members can have vigorous and highly contested elections within their party caucuses, but it is considered a requirement that each Member of the party support their party’s nominee on the House Floor when the actual election for Speaker occurs. In fact, for someone to continue a campaign by appealing to the opposition party for votes would be considered a traitor to the party. 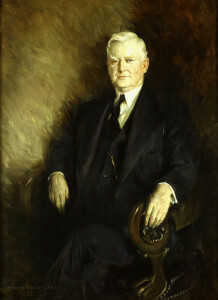 John Nance Garner was elected the 44th Speaker in 1931 with only a 2-vote victory. Technically, however, on the House Floor, Members are free to vote for any candidate they chose including people who are not even Members of Congress – though no outsider has ever been elected Speaker. The winner must receive a majority of those present and voting – which means vacancies and absences can affect the number required to win. Occasionally the election for Speaker can become interesting as when enough majority Members abandoned their own their own party’s candidate, denying him enough votes to win. In 1917, a handful of Progressive Republicans joined with the minority Democrats to elect a Democrat as a Speaker. That is probably a once-in-a-lifetime occurrence, but there been some close elections. In January 2015, John Boehner was reelected as Speaker despite 24 Republicans voting for other candidates and one voting “Present” (none of them voted for Nancy Pelosi, the Democrat’s nominee for Speaker). In 1931, Speaker John Nance Garner won by only 2 votes: He received 218, but 216 were needed for victory since 430 votes were cast in that election. But as remarkable as the close elections are, an equally astounding fact is that, according to the Congressional Research Service, from 1943 until 1995—over 50 years—Members only voted for their party’s nominee. Speaker Jim Wright of Texas was the last presiding officer to resign mid-Congress. Although in extraordinary occasions Members might cast their ballots for someone other than their party’s nominee, the actual process of voting is fairly standard from election to election. At the beginning of a Congress, the House Clerk from the previous Congress will call out each Member’s last name; the Member will vote by calling out the name of their candidate; and tellers, Members of the House specially designated for the election, will record the votes. If a Speakership vacancy occurs during a Congress, the election might be a little different, depending on the circumstances. 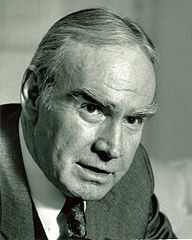 When Speaker Wright announced his resignation in 1989, he said it would go into effect upon the election of his successor. According to the Deschler-Brown Precedents, the official compilation of the rulings of the chair as to how the House should operate, Speaker Wright presided over the election of his own successor. Wright called upon the chairmen of the House Republican Conference and the House Democratic Caucus each to nominate a candidate for Speaker. Four Members of Congress were selected to tally the votes and voting commenced. House Majority Leader Tom Foley was elected Speaker, 251-164, with his own predecessor voting for him. (And like his predecessor, Foley’s career also ended ignominiously, since he was the first sitting Speaker to lose reelection since Galusha Grow in 1862.) Other than resignations like Wright’s, vacancies have occurred mid-Congress due to the Speaker’s death. Before Foley’s election, John McCormack of Massachusetts was the last Speaker elected mid-Congress due to the death of his predecessor Sam Rayburn. However, there was a couple months gap between McCormack’s accession and Rayburn’s death, because the House was not in session. Rayburn himself took over for a deceased predecessor, William Bankhead of Alabama, who died on September 15, 1940. However, since the House was in session, the election occurred immediately, with the Clerk presiding. The Democrats nominated Rayburn, their Majority Leader, but the Republicans did not even offer token opposition. Rayburn went on to serve for 17 years, longer than any other Speaker in history. Nowadays few could dream of such a tenure—and even fewer would want it for that long. Whenever a Member is elected Speaker, typically, there races for party offices too. At the beginning of the Congress all positions are considered vacant. Each party will select a nominee for Speaker and then they will elect the various leadership positions each party has. The Republicans will select a Majority Leader, Majority Whip, Republican Conference Chair, Republican Policy Chair, Majority Whip, Chief Deputy Whip, as well as several other elected posts. The Democrats, now as the minority, choose a Leader, a Whip, an Assistant Democratic Leader, the Democrat Caucus Chair, the Chief Deputy Democratic Whip, as well as several other elected positions. It’s important to remember that the entire Congress only votes on the position of Speaker. All the other positions are elected by the parties themselves. It would not be reasonable for the Republican majority to vote on who the Democrats’ Leader should be, and vice-versa. But the Speaker represents the entire House, so all Members are entitled to vote for the position. So, at the beginning of each of Congress all of the elections for the various positions are held even if the current occupants are running for reelection. The rules are different, however, when a vacancy occurs in the middle of the term. While many assume Kevin McCarthy will be elected Speaker, the Majority Leader’s position will not be vacant until then. If McCarthy is not nominated or loses on the Floor, he would remain Majority Leader. Therefore, the Republican Conference can’t really hold an election Majority Leader until McCarthy is formally elected Speaker on October 29, the date set by current Speaker John Boehner for the election of a new Speaker. It is possible, of course, that the same rump group of Republicans that threatened to “vacate the chair” earlier this year could try to prevent the Republican Conference’s nominee from being elected Speaker. However, such an action would mean the Congress did not have a functioning majority and result in a constitutional crisis. Let’s say that Congress does not elect a Speaker on October 29, just a week before November 5, when Treasury Secretary Jacob Lew says the country will hit the debt limit. Under the Rules of the House, no business can take place without a Speaker in office, so the government would be unable to resolve any debt limit issues. This is not unprecedented. In 1855, with the threat of Civil War looming, Congress had split into four parties and went for two months without being able to elect a Speaker. This standoff was finally resolved when Congress voted to allow the Speaker to be elected by plurality. The Republican Conference met last week and considered a change in their party rules that would have forced Members seeking higher leadership offices to vacate the current positions before they can run. In other words, Kevin McCarthy would have had to resign his position as Majority Leader in order to run for Speaker, and current Majority Whip Steve Scalise would have to resign his position before he could run for Majority Leader. However, these are not the current rules and the Conference did not choose to change those rules at their meeting. Speaker Boehner’s announcement on October 5 postponing the other leadership elections merely acknowledged the current rules of the Republican Conference. As a result, there will be no election for McCarthy’s successor until McCarthy is actually elected Speaker. Then the new Speaker would select a date for the Republican Conference to elect the Majority Leader. If Mr. Scalise wins, the conference would hold a subsequent election to elect a new Majority Whip. If Patrick McHenry, the current Deputy Majority Whip, is elected the Majority Whip, his position would be filled by subsequent election within the Conference. This most recently occurred when Majority Leader Eric Cantor resigned his position after being defeated in a Republican Primary in June 2014. Kevin McCarthy, who was the Majority Whip at the time, was elected Majority Leader. One hour later, an election was held to fill the vacancy created by his election and Steve Scalise was elected. It was much less complicated because the only real contest was the election of new Whip, since McCarthy had only token opposition for the position of Majority Leader. This time it appears that almost every position within Republican leadership will be contested with the exception of the Republican Conference Chair. The current chair, Cathy McMorris Rodgers of Washington State, decided not to run for any other leadership position and therefore there is no vacancy. Some are interpreting the sequential elections as a setback for Steve Scalise who announced that he has the votes to be elected Majority Leader. Some conservative members of the Republican Conference would like more time to find a candidate to run against the two current candidates, Scalise and House Budget Chairman Tom Price. However, this is not why the elections for positions under the Speakership will be held later. It is not likely that Speaker Boehner would bend over backwards to accommodate the very same people who have made his life miserable on a daily basis since he became Speaker in 2011. Speaker Boehner’s announcements postponing the other party leadership elections merely acknowledges the current rules of the House Republican conference. The Conference can change the rules if it likes but so far has not done so. If the announcement is politically motivated, it may be to prevent the rump conservatives who might want to back their own candidate for Majority Leader, from holding Mr. McCarthy’s elevation to the Speakership hostage on October 29, assuming he wins the nomination of the Conference on October 8. If McCarthy does not win 218 votes—i.e., if the hard right does not support him on the Floor of the House—there will be no candidate for Majority Leader for these individuals to rally around, because the job will not be vacant. Welcome to hardball politics. It’s a race to see whether we will have a Speaker or a World Series Champion first. Works Consulted: Beth Richard S. and Valerie Heitshusen. Speakers of the House: Elections, 1913-2015. Congressional Research Service, 6 March 2015.